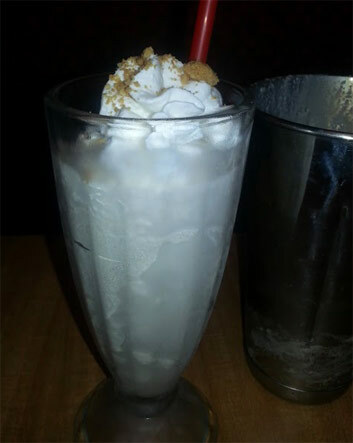 On Second Scoop: Ice Cream Reviews: My First Smashburger Shake ! Nutter Butter !! My First Smashburger Shake ! Nutter Butter !! So there I was Thursday night, waiting in the crazy long line to get in to the mall. The light was red, I was looking around... and that's when something new caught my eye. Smashburger? That wasn't there before! The light turns green, I pull into the mall, and quickly grab my phone to check their menu... oh yeah! 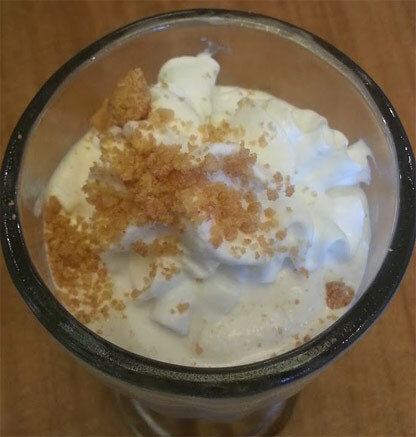 Haagen-Daz premium shakes! Oreo! Butterfinger?! NUTTER BUTTER?!?!?! Forget Five Guys, I know where I'm going for lunch tomorrow. The best part of my meal was easily this Nutter Butter Shake. It was perfect, literally just perfect. I wouldn't change it at all... except to say I wish there had been two of them. So tasty! Ok, so my buddy comes out to lunch once in a while (the same one that usually meets us for our Sonic trips) and so we're talking over IM when I mention the new place. After I send him a link to their menu, it takes him all of 15 seconds to decide that today is a great day to meet for lunch. He travels a fair amount for work, so he's a bit of a burger expert, plus I made him take pictures since I forgot my phone (DOH!!). The place was busy but we waited in line for only about 2 or maybe 3 minutes, nothing major. They took our order, gave us our numbers to put on the table, and off we went. In what felt like maybe 90 seconds, I already had my shake. Now you may or may not have noticed above that the shake glass is somewhat thin, at least at the bottom, but you definitely noticed that it came with the metal mixing cup which had about another half glass worth of shake in it. This shake really was great. Perfect amount of peanut butter flavor, nice and thick, but not too thick, and it was oh so hard not to inhale. It had little bits of nutter butter cookies speckled throughout the shake, but it wasn't gritty. No no, it was just wonderful. I'm so going back for the butterfinger shake... and maybe the Salted Caramel one... yeah and the Oreo one too. $4.29 sounds (and feels) a bit high at first, but we're talking Haagen-Daz milkshake with nutter butters mixed in. It was so worth it. Another two minutes went by and out came our bacon cheese burgers. They looked great, and the big pile of thin fries made for an interesting looking companion. The good news is that the burgers are juicy and taste oh so fresh in the neat egg bun. The bad news is that we were both overcome by how salty these burgers came across. I would have thought I was being overly critical, but like I said, my bud has been to a fair share of burger joints and he agreed. It was too much. It just seemed like everything in the burger accentuated that salty vibe and it wore both of us down. The first few bites were neat, but by the end we agreed that we wouldn't be rushing back (unless to just grab a shake). So that was my first trip to smashburger, which now has over 200 locations (and some 105,000 facebook fans). It was definitely neat to feel like one of the first people to try a smashburger in New England. The store was clean (it's less than two weeks old), the staff was friendly, the food was fresh, I loved the shake, but I just didn't love the salt factor. Maybe in a month or two I'll head back for the butterfinger shake and maybe a chicken sandwich, but for now, I'm in no rush to go back for lunch. Update: Several of my coworkers have tried smashburger and didn't have any salty troubles... though technically they still prefer five guys.